Found yourself considering hyper-v? Microsoft has come a long way and is now becoming more popular as a serious contender in the hypervisor area. My preference is still VMware, but some businesses may find their Microsoft allegiance makes hyper-v a valid option. Note, i do not consider Microsoft a “cheaper” solution in any circumstance. The current state of hyper-v, SDN options, clustering and VMM management falls very short of what VMware has out of the box. Anyhow, if you do choose windows, here is how you remove the GUI – hopefully saving you a little bit of RAM and reducing the running footprint open for attacks and vulnerabilities…. Note : always use windows firewall. If possible also consider AV solution to further protect your hosts. 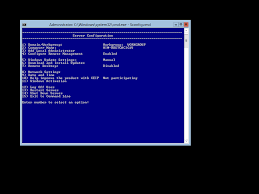 This entry was posted in Windows and tagged 2012, convert, core, hyper-v, powercli, Windows, windowsfeature by Daz. Bookmark the permalink.